And the theme of the year was weddings. Over Labour Day weekend Chris and I attended wedding five out of five and ended our "year of weddings" with a bang. I should mention that only one of the five was in the City, so we were going to weddings literally all over the place - Puerto Vallarta, Toronto, Victoria and Quadra Island. My dear friend Ari's wedding to Tyler was the perfect way to finish with a weekend-long celebration on beautiful Quadra. It was a very special wedding and we had way too much fun with many of my oldest friends. Turns out these parents still know how to have a good time. Don't get me wrong, I love weddings. Love, love, love weddings. But after attending five weddings since April I have learned that it is a very different thing to be a guest than to plan a wedding like I do for work. Travel plans and expenses, careful outfit selection and gift giving, being a guest requires personal rather than organizational planning, which turned out to be more challenging. Plus, if it's smoking hot like it was in Toronto you can't retreat to the kitchen with the caterers to cool off. Next year I hope we can take it a little easier. 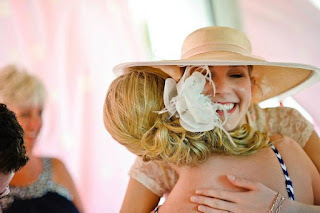 I am already looking forward to the weddings of two of my best friends (that's you Linds & Kel!) and am planning to jam-pack my schedule with as many clients as I can handle, but for now I'm just happy to look back on the photos from this year's weddings with fondness. Five weddings, five outfits and only one skirt repeat. Yay me! Breezy and bright in Mexico for Devon & Kris. 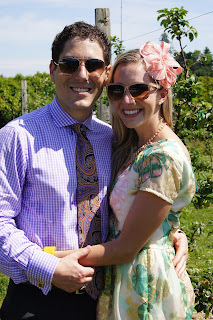 Pastels and a fascinator at UBC Farm for Julien & Bracken. Gauzy for 40+ degree weather in Toronto for Katherine & Gus. Just the two of us (and a favourite dress) in Victoria for Ruth & Ricky. Family time in a floor length dress for Ari & Tyler on Quadra.